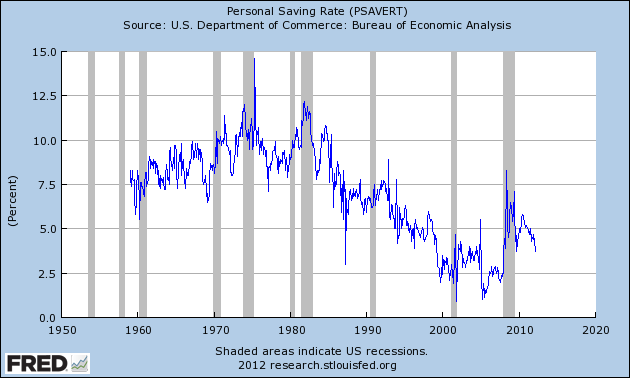 Is the U.S. in a savings crisis? We think not, though one may be brewing if attitudes toward the budget deficit don’t change in Washington. The fact is that for the past 20 years, America has grown faster than Europe and Japan, two of the world’s highest savers. Year after year, U.S. deficits are financed, bills are paid, and living standards rise. If anything, America is awash in money. So where’s the crisis? 2008 answered that question pretty well, I think. They asked for a crisis, and they got one. This is the same slack-jawed cocaine-addled bozo thinking that led some very serious analysts to declaim that subprime was “contained” in 2007 (of course, we know now that thanks to the cult of endless syphilitic re-hypothecation nothing can be contained), and the same brand of thinking that leads some very serious economists today to claim that the threat of an alien invasion would trigger an economic recovery. It could only go up and up, right? This time is different, right? I know, I know. Correlation does not imply causation. But that’s a pretty brutal correlation: personal savings fall lower and lower and lo and behold we hit a once-in-a-generation crisis. (Of course, if governments keep repeating the policies that led to that “once in a generation crisis”, it will be soon be a twice-, or thrice-in-a-generation crisis). So what brought us here? What took us from the savings and investment-driven society of the postwar years to the wild-eyed derivatives, hookers and iPads society enchained to a crushing swathe of debt? Was it moral decline? 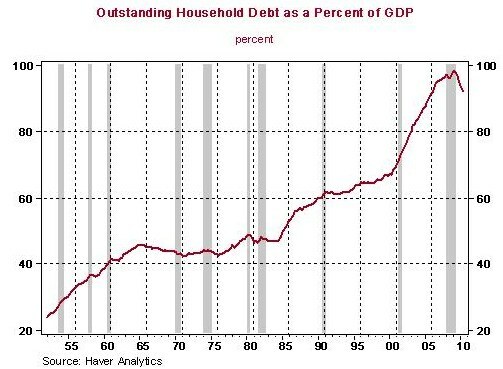 The decline of the notion that debt is something to be avoided? Was it the softening and fattening of society, bread and circuses, Superbowls and all-you-can-eat Vegas buffets? The aura of American invincibility having won the cold war? The arrogance of modernity, and the undying myth that “this time is different”? All factors played their part. However one shines out above and beyond any other: the intellectual fallacy that all GDP is equal, and that GDP growth — even debt-driven growth, even growth based on lies, fallacies and errors — paves the road to the future. Simply, the social variables emerged from a period in which the dominant intellectual, governmental and media culture condoned and actively encouraged profligacy. Easy money policies pushed by Greenspan and the lackeys of irresponsibility discouraged savings in favour of consumption. As it became less (in the short term) expensive to borrow and consume, more people did it. It became socially acceptable. As the debt was securitised, and pumped off into the shadow banking system for endless re-hypothecation and carry trading, the companies issuing the debt stopped giving a damn about creditworthiness. The easy-money mythology led to house price rises that seemed never-ending and built up the social acceptability of remortgaging your house, and spending the proceeds on boats, cruises and keeping up with the Joneses. That is where the BusinessWeek article picked up; to an objective observer versed in history, the United States fiscal and financial situation in 2005 seemed perverse and absurd. 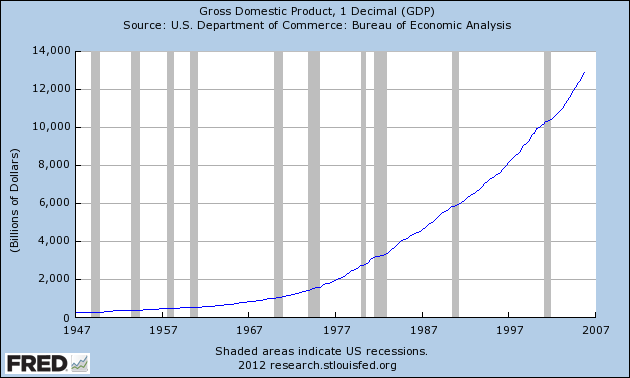 But GDP kept growing, and the hopium kept flowing, and so this time it was different until it wasn’t. The thing about GDP, is that it doesn’t really measure wealth creation, or the size of the economy. It measures a derivative of that: money circulation. If Congress passed a law saying that everyone in America had to smoke meth (hey, if you can mandate the purchase of health insurance, why not mandate drug consumption in the name of increasing GDP?) and gamble all their disposable income on horse racing, GDP would almost certainly improve. And that’s growth, right? Except it isn’t. Real growth comes from innovation, productivity, imagination, and hard work. You can attempt to quantify it, but there is no easy catch-all number that will give you a quick and simple insight. In 2005, we were where we were five years previous. That looked problematic at the very least. 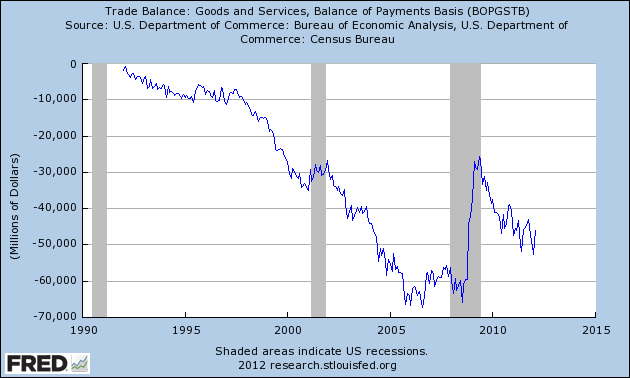 In 2005 — after a century of being creditor and importer to the world — America was running the greatest trade deficit in history. America was losing its spirit of self-sufficiency, which in my view was one of the keys behind its earlier successes. So it was easy to find a brewing crisis without even looking at the crisis of savings, and without even looking at the growing bubbles in subprime, in the DJIA, in securitisation, in student debt, and in McMansions. But only if you knew where to look. Only if you knew that the concept of GDP — the prism through which the political and intellectual hoi polloi viewed the economy — didn’t really represent the underlying reality. The frightening truth is that those who do not learn from history are doomed to repeat it. And the focus of the intellectual and governmental elite since the crisis has been on reflationism — reflating GDP, housing, stocks, corporate earnings, consumer borrowing — with no regard to the concept that the system being reflated is the problem. This entry was posted in Current Affairs, Economic History, Economics, Economics for the Jilted Generation, Federal Reserve and tagged businessweek, consumption-led growth, personal savings, reality. Bookmark the permalink. @ Aziz “The frightening truth is that those who do not learn from history are doomed to repeat it. And the focus of the intellectual and governmental elite since the crisis has been on reflationism — reflating GDP, housing, stocks, corporate earnings, consumer borrowing — with no regard to the concept that the system being reflated is the problem”. And why would they? They are wrapped a bubble of advisers, Policy wonks, and great pay, all expenses paid trips, and meals at the various engagements they attend. However these politician are venturing out of their bubble to do “research”. A politician doing their own research like the good old days! Perhaps they need to go further and try and break out of Welfare the following week and create a Lemonade Stand, organic of course, using Lemons from local farmers. They need to register the business to ensure all Taxes are paid, then after the get through the planning permits etc, and turn a profit, file a tax return, ensuring all items are correctly filed. Then maybe they will have a light bulb moment! The www is a global paradigm shift. Hedge funds Alibaba Amazon only scratch the surface of where we’re headed. It changes the superficials, but really I don’t think it changes the fundamentals very much. Good businesses are still good businesses, bad businesses are still bad businesses. Same thing with myspace; good music was still good music, bad music still sucked. www changes the structure. Production moves out of the factory in to the home office/workshop. 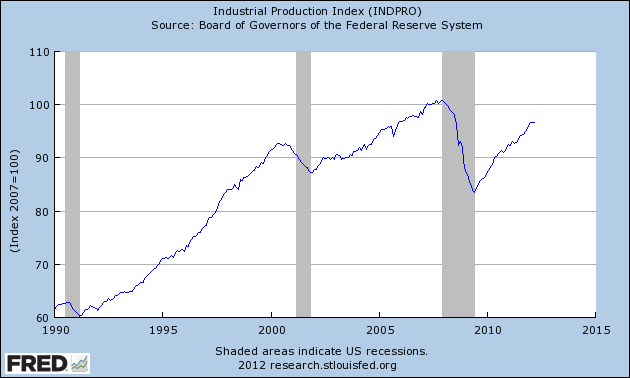 Pingback: Guest Post: Where’s The Crisis? Dear Ms Bryce. I won’t address you in the correct manner. You bring disgrace to the title. If the Citizens of Australia are going to pay for your lavish wardrobe and various trips and expenses, then at least support Australian industry and commerce. The gifts you gave to President Karzai, a Stuffed made in China Kangaroo and a Chinese football, are a joke and an embarrassment. You could have given Australian Opals, fine wine, or even food. I am sure the food would have been fresh. You would have flown direct. What would President Karzai think? He comes from a proud line of Leaders. Alexander the Great travelled to Afghanistan. I don’t know if you or your advisors made this decision, but it shows lack of intelligence, dignity and judgment. This is my first letter I have written to the office of the Governor General. I am a Monarchist, and generally support the work you have done, but this role should be getting value for the Taxpayer, assisting Australian jobs and industry, and giving world leaders an insight into our culture. Not cheesy jingoism. I would have expected better. I demand an explanation. Please write a formal letter, signed by the Governor General, not an operapaid staffer and address below. You are wrong according to these guys.